Chicken strips & honey mustard. OK so these are great, super quick and easy. I’m probably the biggest honey mustard fan on the face of the earth (great for dipping fries). Some places have good HM some not so good but I do critique them all (watch out). This homemade HM is some of the best and again so simple. The chicken strips are very tasty and are not as heavy or bad for you as when their baked instead of deep fried. Also the fact that it’s not processed chicken tenders form some fast food joint. It’s the real deal straight out of your kitchen making it that much better, health wise and taste wise. Recipe on rotation in this house, six thumbs up! Makes 4 small 2 large portions. Recipe from Simple Bites. So this is super easy, especially if you bought your chicken already in strips. Combine buttermilk, salt and pepper and paprika in a bowl. Marinate strips of chicken in mixture and put in fridge for 15-20 minutes. While chicken marinates combine corn flakes (already crushed well)m and panko bread crumbs and crush more to make panko bread crumbs a bit finer and set aside. 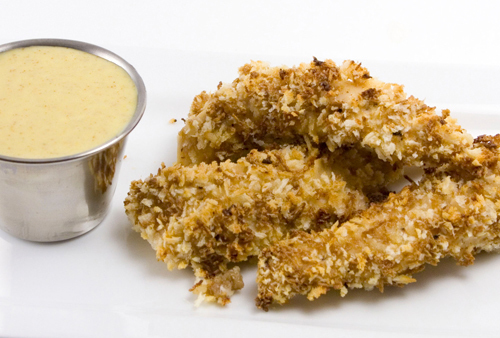 Make honey mustard by combining mayo, honey, and mustard and mixing well, store in fridge until ready to serve(d. Take out marinated chicken strips and coat in bread crumb/cereal mixture and place directly on sprayed/greased oven rack (place tin foil or a large cookie sheet on rack below to catch droppings). Bake at 375 degrees for 20-25 minutes (depending on thickness). Set to broil and brown/crisp tenders for an additional 3 minutes. Serve with honey mustard dipping sauce. Some serious yum factor going on here. This entry was posted in American, chicken, Food, Whole foods and tagged baked, chicken, chicken strips, dinner, fingers, healthy, honey, honey mustard, lunch, mustard, organic, snack, strips, tenders, Whole foods. Bookmark the permalink. Both comments and trackbacks are currently closed.